While away this last weekend, we were housed in the domicile of friends, George & Morty - or as we refer to them as a couple "Georty". Oh, what hell Brangelina and Bennifer have done to us. And while we were staying at their house for the night, they would not be there - but more on that in a different post at a different time. We got instructions on how to feed the dogs. You'd think it was a simple, straightforward process, but alas, certain doggies are used to certain routines and it turns out, they look at you like you are a moron if you don't do it to their protocol. The other housekeeping item was about this plant. Both George and Morty gave us separate but similar stories about a seldom blooming plant that smelled...........and smelled bad. 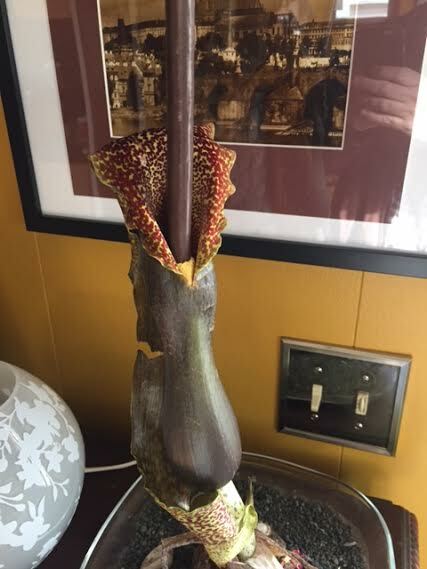 Morty told me how when he was home, it would bloom but he'd be looking around the house to see if the dog(s) had pooped in the heating grate, since that seemed to be the general aroma. His telling of his adventure to George upon his return home would get a semi-incredulous response. ......until George was home one day, looking around trying to find where the dogs pooped in the house. I think George was just showing 710 the plant, relating the story. I don't really think it was a 'in case this happens while we are gone.....' thing. Still on Sunday morning, I went outside with the dogs to play. At one point 710 came outside and I went in. The stench was nasty. And wouldn't you know, I looked around to see what was what. To me, it didn't quite smell like dog-doo, but I couldn't quite place it. Then I noticed the opening of the flower around the stem. Had you seen it prior to the bloom, you'd never see that opening or that colour. 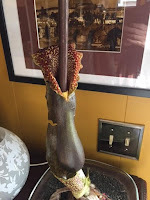 The brown would normally wrap around the stem. Soon after, 710 came in and was looking around, and finally asked what that horrible smell was. I found it a little humourous. A spelled out tale - to the letter.....twice - and it goes completely ignored. And even questioned when it is pointed out. We left before Georty came home, but I texted a picture of the plant. I can only imagine they chuckled at our stupidity. But that's the way it goes. It looks like a funky plant. thanks for your stuff and nonsense. your part of my morning routine now, me likes it. (no pressure) sorry bout petey, our duke (20 lbs, long hair chiwowwa/mix sumthing) is going on 16 come may, so its not lost on us. thanks again. ted. Why would someone have a plant in their home that smelled so bad?!?! My point exactly, Mark in DE. Such is the lot for living with an entomologist/plant biologist.